Are you a harassed mother eager to start your child on solid or finger foods yet finding it physically exhausting to keep to your high standards of hygiene and cleanliness? Young children tend to make a mess when they feed themselves from a high chair or sit down for meals at the family table. Fisher-Price has come up with an ideal solution to help you maintain the cleanliness of the tools your child use. The Healthy Care Booster Seat is a good buy to put your mind at ease that your child is feeding from clean and bacteria-free surfaces. 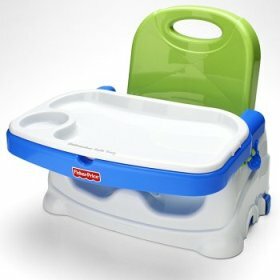 The Booster Seat comes with a snap-on lid to keep the feeding tray clean until it is ready for use. The tray can be popped into the dishwasher for sanitization. The booster comes in bright attractive colours and is easily cleaned because there are no unnecessary crevices to trap dirt or crumbs. Moreover, the front and rear seat straps can be adjusted to fit any chair. The Fisher-Price Healthy Care Booster Seat is compact and portable – it can be folded easily to be carried along with other baby’s necessities wherever you go. There is even a strap to be slung over the shoulder for easy portability. This entry was posted on Monday, December 31st, 2007 at 9:36 pm	and is filed under Interesting Stuff. You can leave a response, or trackback from your own site.